We challenged all of our youth workers to complete DYMU 101 by the end of the month. Its been so fun seeing the feedback as veterans and rookies have responded well. We have 10+ year veterans that love it and brand new rookies hungry for more. One of our NEW 10th grade small group leaders sent my wife this text after our second meeting. 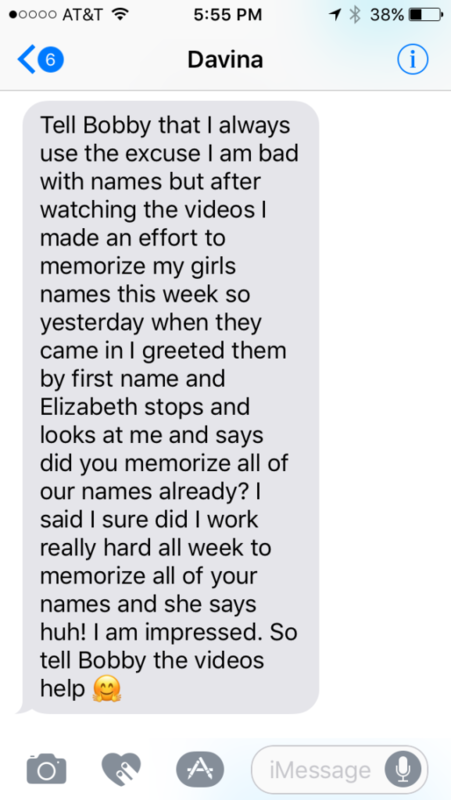 Elizabeth, one of our most active sophomores fell in love with her new small group leader because she remembered her name. This leader, by challenging herself to memorize names (from DYMU’s YM101 – Session 3), just communicated that she is already invested and cares for her group on WEEK TWO. I can’t wait to see what God does with our 10th graders this year because of leaders that have been trained. This is what it is all about! DYMU is instant, online video training for your youth ministry volunteers. Check out DYMU today!